FSC contributes to this goal in a variety of ways. For FSC, the enforcement of relevant laws is the basis of sustainable forest management. This is reflected in FSC Principle 1 and elaborated in specific requirements regarding legal rights to harvest and harvesting activities, environmental and social requirements, and customary rights. In particular, FSC focuses on free, prior, and informed consent (FPIC) for local people and Indigenous Peoples. FSC requires forest managers to publicize a non-bribery commitment (neither paying nor receiving bribes) and, depending on the situation, take specific measures to ensure their non-involvement in corruption. 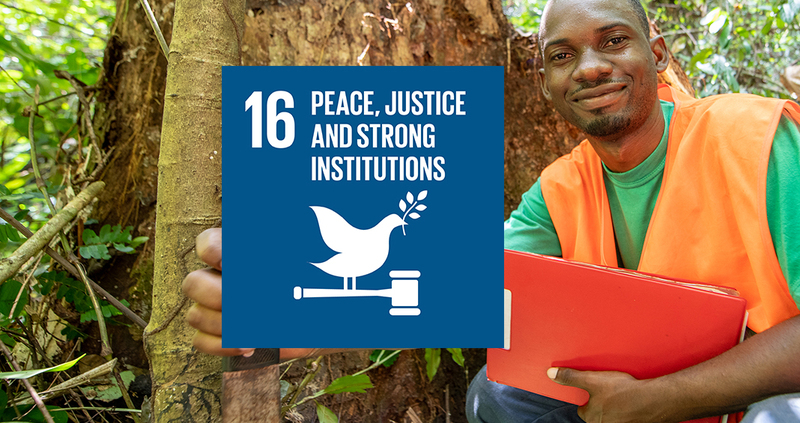 In this way, FSC contributes in particular to SDG targets regarding the rule of law and reduction of corruption and bribery. Moreover, FSC, through its governance system and stakeholder engagement in political decision-making at international and national levels (including in the development of national standards and in preparation for certification decisions), is an example for other multi-stakeholder-based certification schemes. Through its FPIC requirements (especially in politically challenging countries), FSC expects its certified entities to establish more inclusive and better governed institutions for negotiations between local populations and logging companies; better managed and more effective benefit-sharing mechanisms; and innovative ways of dealing with problems related to infringements of customary uses. • Principle 1: Compliance with Laws. The Organization shall comply with all applicable laws, regulations and nationally ratified international treaties, conventions and agreements. • Principle 3: Indigenous Peoples’ Rights. The Organization shall identify and uphold Indigenous Peoples’ legal and customary rights of ownership, use and management of land, territories and resources affected by management activities. • FSC’s governance and stakeholder engagement system a role model for other certification schemes.